GOMMA » Dimitri From Paris returns to Gomma with Hess Is More. Free Download! Dimitri From Paris returns to Gomma with Hess Is More. Free Download! King of Disco Dimitri From Paris did a few things for Gomma and our sublabel Toy Tonics. Now he is back with a remix for the new Gomma band Hess Is More. The experimental collective around composer Mikkel Hess. The band released their “Bearsong” EP in june. 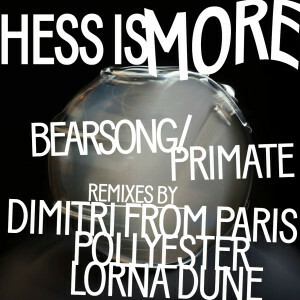 Now here comes the Remix EP with remixes by Dimitri From Paris, Pollyester and Pitchfork favorite Lorna Dune from NYC. Categories: Gomma Releases, Hess Is More.